At least 16 people were killed and 38 wounded Tuesday when a minivan packed with explosives detonated as security forces were trying to defuse it in southern Afghanistan, officials said. 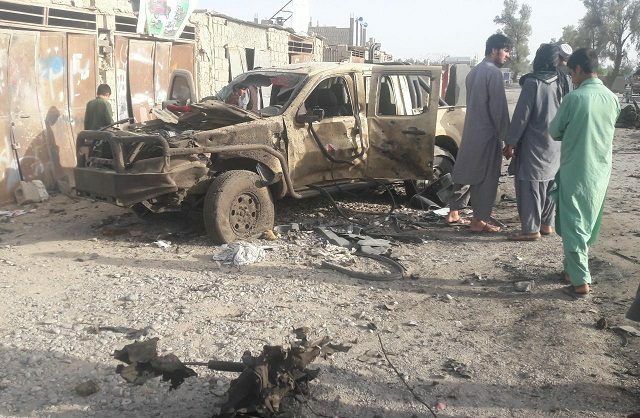 Security forces in Kandahar had already cleared the area around a bus station where the van was found, provincial governor spokesman Daud Ahmadi said. “As the security forces were trying to defuse the van, it detonated,” said police spokesman Mohammad Qasim Azad. “The latest figures show 16 dead and 38 wounded people brought to the hospital. We still have two ambulances at the site because there might be more people under the rubble,” Dr Nehmat Barak, chief of the Mirwais Hospital in Kandahar, said. Ahmadi confirmed the toll, adding that the dead included four security forces personnel. At least five children and 10 members of the security forces were among the wounded. The blast was so powerful that the majority of the casualties were passers-by outside the cleared area. Ahmadi said security forces also found a large container of explosives, rocket-propelled grenades, suicide vests, and ammunition near the site. “The terrorists planned to conduct a big attack at end of Ramadan in the city among crowds of people as they went out shopping for Eid… security forces prevented a disaster from happening,” one security official told AFP. The blast comes as the Taliban step up their spring offensive across the war-torn country. Last week the insurgent group attacked western Farah city, but were repelled by commandos backed by the Afghan and US Air Force. On Monday, the Taliban warned Kabul residents to avoid “military centres” in the heavily fortified city, saying they are planning more attacks in the Afghan capital. A US government watchdog also warned Monday that upbeat assessments of improving security in the country did not match facts on the ground. The Pentagon’s Office of the Inspector General said there were “few signs of progress” in the fight against the Taliban. Top US officials and military commanders insist the Afghan security forces — which have suffered thousands of casualties and are beset with low morale and corruption — are now doing a better job of maintaining order.